apparently required by the HS2 trains. We cannot see a feasible design being developed within the Limits of Deviation established in the 2016 Act. a) The Background to our Concerns. We are writing to alert you to a matter which we believe to be critical to the future of the HS2 project. HS2 was announced seven years ago and construction is due to start on in our area in about fifteen months. We have already been presented with a succession of schemes for HS2’s new tracks into Euston Station. Yet so far there has been no proposal from HS2 Ltd for bringing the trains through the Euston Approach which in our view does not carry with it unacceptable safety risks. The risks inherent in the latest scheme (hereafter referred to as the March 2017 scheme ) are set out in the attached Technical Report, written by the specialist railway structural engineer who has been advising us. Forgive us for writing at some length but we believe the importance of the matters we bring to your attention justifies a reasonable level of detail. Our letter finishes with seven questions. We would be very grateful to receive answers to these as soon as possible. If it would be helpful if we came to see you in person, together the engineer who has been advising us, we would be very happy to do so. b) The First Appearance of the March 2017 scheme proposed by HS2 Ltd for the Euston Approach. We were first alerted to a new scheme being developed by HS2 Ltd for the Euston Approach by Camden’s Chief Executive on 26th August last year. 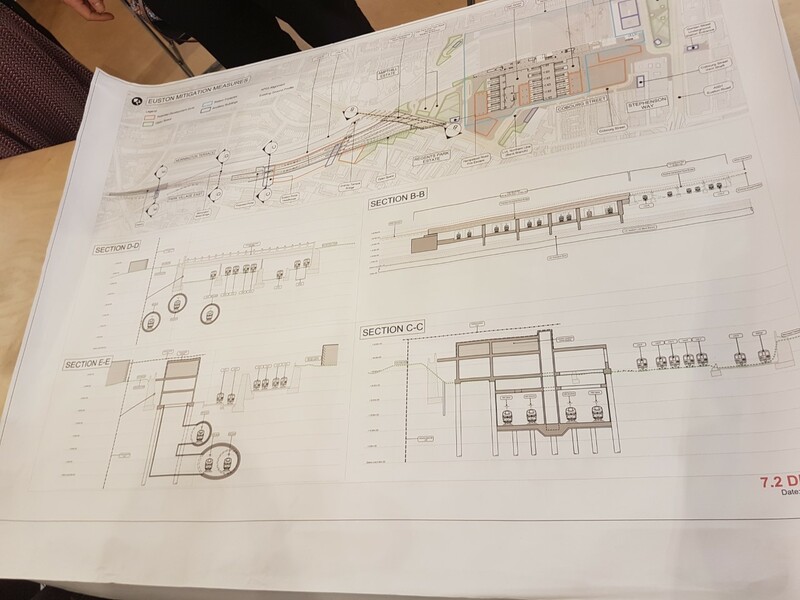 On 3rd March this year, at a second meeting with community representatives, HS2 Ltd presented two drawings showing an outline design for this March 2017 scheme. We understand that by this date this new scheme had been approved by HS2 Ltd’s technical board, and that it therefore had superseded the previous AP3 scheme. (It was of course on the basis of the AP3 scheme that Camden residents and businesses petitioned Parliament). Image 1 as described. Click to enlarge. HS2 Ltd has since released the first drawing, a plan comparing the March 2017 scheme to the previous AP3 scheme, and we attach this here. The second drawing is a series of four cross-sections of the March 2017 scheme. This drawing has not so far been released and for the meantime we are dependent on an informal photograph taken on 3rd March by a local resident; we also attach this. Any design for the Euston Approach will have particular difficulties with the stretch known officially as the Euston Cutting but now commonly referred to as the Camden Cutting. This famous railway pinch-point begins at the southern end of the existing Park Street Tunnels (under what is now Parkway) and extends southwards between retaining walls supporting Park Village East on the west side and Mornington Terrace on the east side. At its narrowest point it is crossed by Mornington Street Bridge. In this area, HS2 Ltd’s plan drawing is particularly hard to decipher, so we have made a coloured version of it, plus a coloured version of the most relevant cross-section, and we also attach these. Image 2 as described. Click to enlarge. At the minimal level of information so far supplied, the March 2017 scheme, in which the HS2 tunnels and portals have been extended southwards, has appeared greatly preferable to Camden residents over the AP3 scheme. This is for two major reasons. With the tracks coming in at a lower level, it would not be necessary to rebuild two important bridges (Hampstead Road and Granby Terrace bridges). Instead, it would only be necessary to extend them, thereby much reducing disruption to road traffic and pedestrians. It would also not be necessary to use the northern part of Park Village East as a construction site, closing this road for up to six years. However, residents are well aware that it was not these mitigating effects which brought about the change. We understand that it was in fact the problems inherent in the AP3 scheme, most importantly the necessity for work to be carried out in the Camden Cutting close to the lines on which trains would still be running. This would risk accidents as well as require many interruptions to existing train services. We have heard that firms preparing to bid for the contract to build the AP3 scheme found it almost impossible to obtain insurance at an economic rate. d) Concerns with the Birdcage structure. Cross Section as described above. Click to enlarge. The very large strutted ‘grade separation’ structure central to the AP3 scheme, known to residents as the ‘Birdcage’, also presented serious problems. Our railway expert has told us that that this was a form of construction not seen in any other railway scheme, in the UK or abroad. Additionally, this structure was to be used as a ‘prop’ support to a new barrette retaining wall which would replace the existing Park Village East retaining wall. Any movement of this barrette wall would result in ground movement extending across Park Village East and into the Grade II* listed John Nash villas on the opposite side of the road. These villas were built in the 1820s and are far from robust. In his presentation to the House of Lords Select Committee on 11th October last year, petitioner Sam Price, a local resident who is also a highly experienced structural engineer, effectively emphasised the unusual scale and design of the Birdcage: ‘A huge, really huge, concrete construction. The sort of thing that I have never come across in my working life.’ Community representatives have recorded that at the meeting with HS2 Ltd on 8th November last year, Rob Carr, HS2 Programme Director, Area South, said that he was somewhat ‘horrified’ by this structure and was keen to get rid of it. …the incomplete information provided by HS2 on track layout in the throat and Camden Cutting and the need for a concrete box or ‘Birdcage’ structure suggests to us that this part of the railway design has … not been fully thought through. e) Concerns with the use of a Design and Build Contract for the March 2017 scheme. While we could see that the AP3 scheme had not been sufficiently thought through, unfortunately this is even truer of the March 2017 scheme. 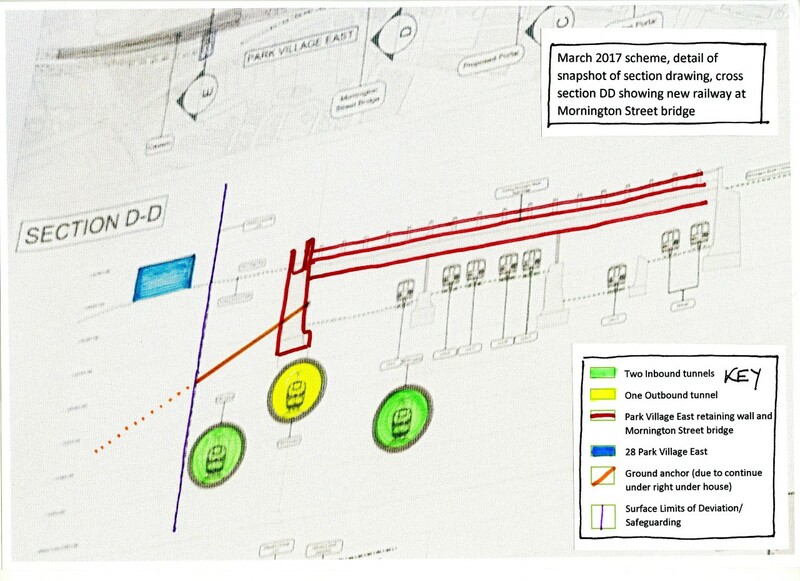 So far this new scheme has only been designed in minimal outline, to be handed over for the ‘Early Contractor Involvement Phase’ to be designed in detail by a ‘Main Works Contractor’ on a ‘Design and Build’ basis (on 1st August this year the contract for the Euston Approach was awarded to the Costain Skanska Strabag Joint Venture). The Main Works Contractor will have only a relatively short period to finalise a design before signing up various specialist sub-contractors, with the construction work itself due to begin in early 2019.
are highly likely to escalate out of control. neighbouring communities is likely to be compromised. Park Village East and in the Cutting itself. f) Concerns with the Attitude and Competence of HS2 Ltd. While we are very concerned about the poor level of information that has been given out, we are even more worried that HS2 Ltd themselves may not have any real understanding of the level of risk that this lack of information will bring. Instead, there appears to be a misplaced belief that contractors will offer innovative solutions that will compensate for HS2 Ltd’s failure to adequately plan their proposed works. This gung-ho attitude was evident when the Birdcage was proposed in the AP3 scheme, and we are concerned that despite the failure of the Birdcage and an earlier superseded scheme, this over-confident attitude is still prevalent. When we spoke informally to Suzanne Crouch, Head of Programme Interface at High Speed Two (HS2) Ltd, on 1st July, she told us, in broad terms, that one reason for putting out the March 2017 scheme on a Design and Build contract was so that a “ground-breaking” innovative method could be found which would solve the puzzle of how to construct this stretch of the new railway. But what this method might be, HS2 Ltd themselves do not yet appear to know. g) Conflicts between Safety and Political and Contractual Pressures. The long-term cost benefit ratio of HS2 remains in doubt. But what seems certain is that firms contracted to build this new railway will make healthy profits (see for example a headline in Construction News for 7th August: Keller targets HS2 windfall – Keller has set its sights on securing £50m of work on HS2 when construction begins in 2019). We understand that Design and Build contracts can be particularly profitable, as without a detailed schedule at the time of signing, they are much more difficult to price. 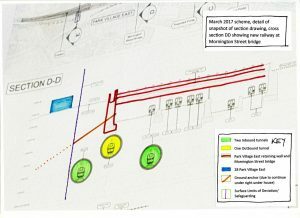 If the Main Works Contractor for the Euston Approach becomes aware during the design stage that the March 2017 scheme is too risky and as a result not feasible, we do not know what incentives there are in place, if any, to encourage the contractor to report such problems at an early stage. Another cause for concern is that so much of work is being planned and is due to be carried out at a number of steps removed from the scheme’s commissioner, the UK Government. We can see a similarity with the over-extended line of responsibility behind the decision to clad Grenfell Tower in flammable panels. In that case, there was the elected authority (the Borough of Kensington and Chelsea), the arm’s length Tenant Management Company, an architect, a main contractor and several specialist sub-contractors. In the case of the HS2 scheme, HS2 Ltd itself is the arm’s length management company, and as noted above, HS2 Ltd has failed manifestly to stamp its technical authority and requirements upon the project. From the beginning of the project, the proposed new railway line has furthermore been split up into sections, now called ‘plots’, each due to have their own Main Works Contractor with several subcontractors. There have also, over the last seven years, been very substantial changes in personnel within HS2 Ltd. And it is has been noticeable that during the design stage, the contracted designers have appeared to change at regular intervals. For example, HS2 Ltd are now seeking to award their third architectural contract for the design of ‘the HS2 station’ at Euston. We do not know, among these myriad enterprises and extended chain of command, who might step up and say that the new design for the Euston Approach is not feasible or, if they did, who would listen to them. It is in many ways very unfortunate that HS2 has continued the receive cross-party support in Parliament. Almost all criticism of the HS2 project, even when it comes from highly qualified sources, has either fallen upon deaf ears within the Government or, we fear, has been actively suppressed. h) Principal Differences between AP3 Scheme and March 2017 scheme. 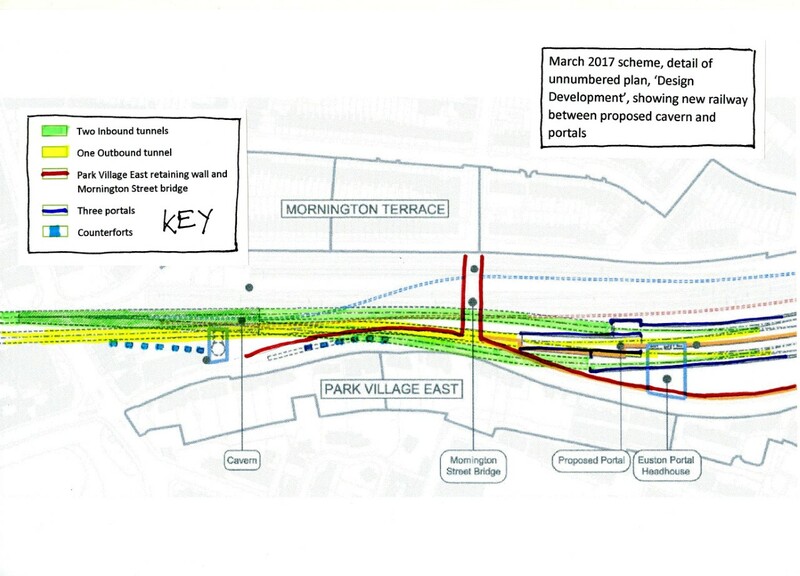 The March 2017 scheme moves the tracks downwards by about 5 m.
to about the same distance south of Mornington Street Bridge. tunnels with three portals in the vicinity of Mornington Street Bridge). road junction to a short way south of Parkway. to be a flattened cone, tapering towards the north. so that it is below the carriageway of Park Village East. about 75 m directly under the existing Park Village East retaining wall. The construction of the Cavern (in lieu of the Birdcage) and retention of the existing Park Village East retaining wall (in lieu of its replacement with the Barette Wall) both represent huge changes from the previous AP3 scheme. We cannot accept that the March 2017 scheme is simply a ‘Design Development’ of the previous AP3 scheme. i) The Need for a new Environmental Statement. Since the March 2017 scheme is being presented by HS2 Ltd as a modification of the old AP3 scheme, HS2 Ltd claim they do not need to provide an Environmental Statement. It is true that the March 2017 scheme retains a similar track layout to the AP3 scheme. But its move to a lower level requires a quite different method of construction, with much more excavation, and in its principal structural forms – both the new Cavern and the existing Park Village East retaining wall – it is radically different. We therefore consider that a new Environmental Statement is imperative, and we are seeking advice with regard to the applicability of the current legislation. While vague about methodology, HS2 Ltd in contrast appear absolutely determined to keep the March 2017 scheme within the Safeguarded areas as set out in the AP3 Environmental Statement, and within the horizontal and vertical Limits of Deviation as defined in the Act. This seems to us to impose an additional and unnecessary level of inflexibility, above that inherent in the narrowness of the site. The Camden Civic Society is very fortunate to have been advised by a specialist railway civil engineer of many years’ experience. This person (who wishes for the meantime to remain anonymous) has provided us with a Technical Report on the March 2017 scheme and this is attached as a separate document. knowledge of this wall and can provide a summary of its problems. j) History of Park Village East Retaining Wall. The retaining walls to the Camden Cutting were built during the widening of the railway in the period 1900-1906. These walls were constructed in solid ‘mass’ brickwork, with a battered (i.e. inclined) face. The higher western retaining wall supporting Park Village East has been a very troublesome structure throughout its history. It has shown a strong tendency to ‘overturn’ (move into the cutting from the top) and it has undergone three serious interventions principally to correct this tendency, around 1920, around 1940 and in the early 1960s. During the repairs of c.I920, very large concrete ‘counterforts’ or buttresses were added on the street side of the wall to inhibit the overturning. The original drawings of the counterforts indicate that they probably extend around 1.5 m below the base of the retaining wall, but one drawing is inscribed ‘depth of concrete to be determined on site’, adding to the uncertainty. On 13th July this year, Park Village East residents were told by a senior engineer working for HS2 Ltd that HS2 Ltd currently had no way of knowing how deep the counterforts reach. Given that, as in the crosssection drawing attached here, the Outbound tunnel may run as close as 1.7 m below the base of the wall, this lack of knowledge about the counterforts is a primary reason for our doubting the feasibility of the March 2017 scheme. The wall has continued to move, as can be seen from the manner in which the pavement and gutter on the eastern side of Park Village East regular sink, requiring that they are frequently repaired to make them safe for pedestrians. The carriageway itself was reconstructed after the 1960s intervention using reinforced concrete slabs and we suspect that these slabs have trapped numerous voids. The vulnerability of the wall and lack of the stability of the back-fill on the street side has been shown up again by the two Ground Investigations carried out very recently at two spots in the northern part of Park Village East; although very minor interventions in comparison with the major construction work planned, these Ground Investigations apparently caused the eastern gutter to sink further in certain places. At the same, time, probably because road traffic was diverted from the east to the west side of the street to make room for the work, some of the concrete slabs appear to have tilted slightly. k) HS2 Ltd’s own recorded Concerns with the Park Village East Retaining Wall. We wish to emphasise that our views on the stability and integrity of the existing Park Village East retaining wall are generally endorsed by HS2 Ltd’s engineers. Earlier on in the history of the development of the HS2 project, local residents were several times told by representatives of HS2 Ltd that the retaining wall had to be rebuilt. For example, Robert Young, an HS2 Ltd engineer responsible at that point for the Euston area, is recorded as having said to a meeting organised by the Regent’s Park Conservation Area Advisory Committee on 13th May 2013: “Our view is that the majority of the settlement is caused by the failure of the [retaining] wall” and “The wall is moving”. villas, the lower row to help prevent sliding, and the upper row to help prevent overturning. It is hard to believe that these measures would be adequate if the wall began to move rapidly, as has happened in the past. The use of the ground anchors to stabilise the wall, which would apparently make use of the weight of John Nash’s listed Park Village East villas, is also highly questionable in conservation terms. l) Concerns with the previous AP3 Scheme. Putting the information we have ourselves gathered on this together with the opinion we have received from our specialist railway civil engineer, we have reached the following conclusion. In the AP3 scheme the retaining wall would have been rebuilt as a barrette wall. Even though it would have been set back, slightly increasing the width of the cutting, this still would not have created enough room for the ‘Birdcage’ structure carrying the new tracks to be constructed safely while the existing tracks continued in use. We are therefore certain that the previous AP3 Scheme would never have been feasible unless the barrette wall were moved westwards to the extent of requiring the demolition of the listed villas along the west side of Park Village East. We would therefore regard any return to the previous AP3 scheme as wholly unacceptable. m) Likely Effects of the March 2017 scheme on the Park Village East Retaining Wall. 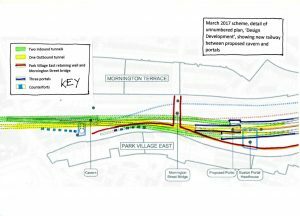 Our specialist railway civil engineer has reviewed the history of the Park Village East retaining wall, and he has expressed several major concerns as to the effects that the March 2017 scheme will have upon the wall. The following is a summary of his comments which are presented in full in the Technical Report appended to this letter. is typical of huge lengths of Victorian/Edwardian structures that line the UK’s railways. earth retained behind these walls. overestimates earth forces that keeps the majority of the UK’s retaining walls in place. considerable movement from its original battered form. effective in restraining movement of the wall. is likely to remobilise earth forces, and the wall will become unstable once more. the listed villas on the west side of the street. movement leading to ultimate structural failure. movement likely to be caused by the proposed tunnelling immediately below the wall. across the entire railway approach to Euston. to pass so close below an existing retaining wall. determine that this risk does not exist. Additional risks are created by the interweaving of the 3 tunnels, which again are passing extraordinarily close to each other. Tower situation. We are sure you will appreciate the gravity of our concerns. n) Likely Effects of Constructing the Cavern below the Park Street Tunnels. Our specialist railway civil engineer has also reviewed the outline proposals to construct a cavern below the existing West Coast Main Line, and also below the structures that comprise the Park Street tunnels. The following is a summary of his comments which are presented more fully in the appended Technical Report. split into two Inbound tunnels, to enter Euston station on the east and west sides. iron decks that are highly sensitive to any settlement. greater any settlement effects will be on the structures above. is without direct precedent in UK construction. There is also a significant risk of catastrophic structural collapse. to the HS2 scheme as it is now developing. o) Rationale for Tunnelling below the Park Village East Retaining Wall and for Construction of Cavern below the Park Street Tunnels. Why do they need to be where they are proposed to be? proposed HS2 station at Euston. London to the West Midlands. north end of the Cavern near Gloucester Avenue – is approximately 750m in length. ‘business case’ – for superfast journey times between HS2’s very small number of stations. they pass below Park Village East and would also eliminate any need for the cavern. much reduced impact on sensitive structures. p) Other Strategies to bring High Speed Lines into Euston. HS2 Ltd would in our view give themselves a greater chance of solving the problem of the Camden Cutting if they were prepared to admit that the Act’s Limits of Deviation are a straightjacket, and that extending the design outside them, something which would be necessary to build a cavern more safely, would be a wise step even if this meant taking a supplementary bill through Parliament. afterwards to rebuild the eastern side. The Camden Civic Society is not against High Speed Rail in principle and in our petitions to Parliament we have supported two alternative schemes that would avoid most if not all of the dangers outlined in the foregoing paragraphs. One is Euston Express, which would bring the new trains by tunnel to Queen’s Park but from there into Euston along tracks at existing track level within the area of existing railway – this would be the equivalent to the pattern on the Continent where high speed trains, for the last few miles of their journey, travel on conventional tracks at relatively low speeds. In particular we have backed High Speed UK, a countrywide alternative to HS2. High Speed UK’s design is far better integrated with the existing railway system than HS2, creating shorter journey times as much by greater connectivity as by high speed. Without an imperative for a continuously high speed, tunnels could be built much deeper under sensitive structures and there would be no requirement at all for HS2’s proposed cavern. Both the Euston Express and High Speed UK schemes envisage rebuilding Euston within its current footprint. This is something which, from the point of view of residents, people working in Camden or just travelling through to another part of London, would be a huge improvement on all of HS2 Ltd’s various designs. q) Questions for which seek Responses from your Advisors at HS2 Ltd and the DfT. How close will the HS2 tunnels pass below the footings of Park Village East retaining wall? and how will they be incorporated into the Design and Build contract? light of the apparent conflict between public safety and political pressure behind HS2? it) and in order also to eliminate any need for the proposed Cavern? We would be grateful for your urgent responses to our questions. 1) HS2 have NOT GOT A CLUE how to build a railway or a 250 mph train. 2) They dont give a damn what happens and are only concerned about the money to be made. 3) This is one big giant rip-off fraud scheme, with bribery and corruption going all the way to the top , I believe. 4) BEWARE !! The standard way that dodgy enterprises like this are undertaken is the following. Take Note. Govt commissions Company A to do X, Company A forms several other Companies to do the Work, Cos B & C. B and C do some shoddy work , take the money and run. Cos B & C are wound up and the culprits disappear “without trace”. The Police and the Courts do Nothing !! and if you are unlucky Lawyers make money out of the case whilst achieving nothing !! Second line:- for ‘sell’ read well. Sorry!